PersonaGrip Allows Drivers to Customize the Human-Machine Interface (HMI). ALL Drivers can have the same benefits in feel that drivers in IndyCar / Formula One / NASCAR / ALMS / Unlimiteds have FELT for over TWO decades. Introducing a new paradigm requires us to embrace this new line of thought: "Tell me what I need to know that I don't even know to ask right now." As ergonomic character adds deeper leveraging surfaces, care must be taken to avoid mistakes including interference patterns that can snag motion. Captured appendages can be devastating upon impacts, so care must be taken to allow escape paths for all steering methods. Dellis gained invaluable design experience in IndyCar, Formula One, NASCAR, ALMS, The Unlimiteds, et. al. Dellis' experience includes over 25-years designing wheels for the world's best drivers: Emerson Fittipaldi, Arie Luyendyk, Michael Schumacher, Nigel Mansell, and Jacques Villeneuve. Today, special molding techniques can offer moldable steering wheels that fit 95% of drivers with a much improved leveraging paradigm for reading steering feedback. PersonaGrip implies personalization; however, personification is giving human-like characteristics to inanimate objects. When the paradigm shifts from the friction mode (needed when grabbing a standard steering wheel) to one where drivers use leverage against surfaces that protrude up off the steering wheel surface, an entire TEAM OF DRIVERS can use a properly molded steering wheel. This new thinking demands that grip profiles also consider correct ingress/egress to various cockpit controls. Good designs can properly accommodate the various shuffle-steer hand motions of various drivers. Myriad other factors influence design during this evolutionary design protocol. When thermoplastic composite materials are used to develop handgrip designs, a trial-and-error process guarantees zeroing-in on the perfect grip over time. 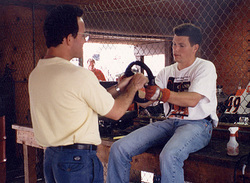 If assistance is ever needed to address a design concern, customers can contact The Steering Wheel Guy for a steering wheel fitting video chat session.